Learn about Biotechnology! 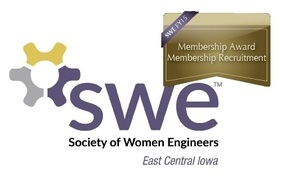 Join us for a tour of the Cedar Rapids DuPont plant. 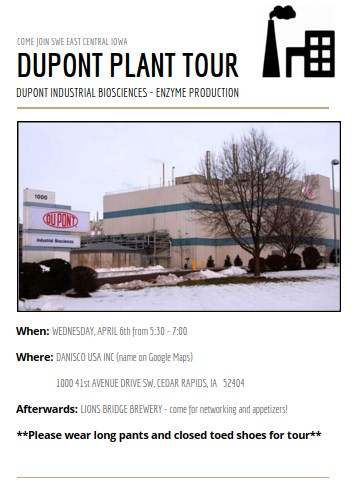 On Wednesday, April 6th, core board member Alyssa will be leading a tour of the DuPont Industrial Biosciences manufacturing facilities here in town. The plant uses large scale fermentation (100-150,000 Liters/batch) of genetically modified microorganisms to produce enzymes used in corn processing, animal nutrition and as additives in laundry and dish detergent. Please join us for this fun and informative event! Afterwards, we will be going to nearby Lions Bridge Brewery for dinner and networking. ​What else? : Wear long pants and closed toed shoes (steel-toed shoes if you have them!). Safety glasses and hearing protection will be provided. You will need to sign a confidentiality form prior to the tour.